Covered markets offer a great change from a conventional grocery store, a chance to buy fresh produce, meat, fish, cheese, wine, and more, and often offer a place for a quick lunch or snack. 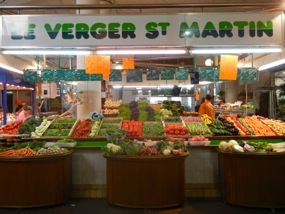 Paris covered markets are open most days and provide excellent fresh food. Here are some to explore, depending on where you're staying. In the Saint Germain area you'll find the upscale Marché couvert Saint-Germain, which is surrounded by great restaurants. 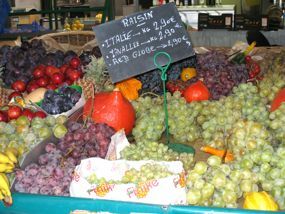 The 10th arrondissement is home to two covered markets: The Marché couvert de St Martin, is not far from the Chateau d'Eau Métro, while the Marché couvert Saint-Quentin is near two of Paris's major train stations: Gare de l'Est and Gare du Nord. Both of these markets date from the mid 19th century. Here's a list of some other covered markets in Paris (remember that the last two digits of the address indicate the arrondissement). Many of these are away from the center of Paris. Fruit at the Enfants Rouges covered market, Paris. Above, St Martin covered market, Paris.